For the questions about the "Boost Likes" services, please read this. If you can't find the answers to your questions on this page, please contact support. We make things as easy as possible. Everything is very straightforward. A lot of tasks can be done in just one click: enable autopost, load website content, hashtag research, turn a web page into your lead page, fetch and upload a video to Facebook, etc. And drag-and-drop: design your campaigns and lead pages, upload a picture, reschedule posts, duplicate posts, reorganize your fanpage list, etc. There are a lot of tips shown on the interface. You may also see some instructions when you hover your mouse over buttons. Please pay attention to them. Fan Page Robot is a web-based application, so it works on Mac and any platform with a web browser and internet connection: Windows, iPad, iPhone, Android tablets, smartphones, notebooks, etc. Its interface is very mobile friendly and can automatically adjust itself to fit your phone screen. It also won't cost you anything to upgrade and use the new features. - No need to download or install anything. - No need to upgrade by yourself -- you are always using the latest version. - No viruses and more secure. What do the hashtag colors mean? Does Fan Page Robot support autopost to Instagram? Yes it supports Instagram. You can post to Instagram or schedule posts from your PC, Mac, or any device with a browser. Fan Page Robot can auto post to Instagram for you without your smartphone and the mobile app. Besides, you can enter any Instagram page URL and post the Instagram content to other social media platforms. What bookmarking sites do you cater? Our software doesn't support any bookmarking sites and we don't intend to support any in future because bookmarking sites won't bring traffic to your sites and won't help with SEO as well. 1. Social bookmarking was used as an effective method for boosting SEO of a website in the previous days, but it has been heavily misused as a cheap and easy tactic to generate lots of low quality links. Google doesn't care about bookmarking links anymore since the Google Penguin algorithm update in 2012. 2. You may find some services like adding your sites to 800 social bookmarking sites for only $5. But be careful, it is spammy and your site will be at risk of a Google penalty after availing such services. Facebook only let me schedule posts for 6 months in the future. How far in the future can I schedule my posts with Fan Page Robot? You can schedule your posts out to 2020. Fan Page Robot will post for you if you're still with us then! What's the difference between the Pro Plan and the Unlimited Plan? Can I manage or autopost to multiple Facebook pages AND multiple Instagram, Twitter, Google My Business and Pinterest accounts using Fan Page Robot? The Pro Plan allows you to manage 3 Facebook business pages or groups and your Facebook personal wall page. You can connect each of these 4 pages with 9 other different blog and social media pages. So you can manage up to 40 blogs or social media pages in total. While using the Unlimited Plan, you can manage as many Facebook pages as you want and connect each of your Facebook pages with 9 other different blog and social media pages. No additional charges or hidden fees. Fan Page Robot groups your social media pages or accounts by Facebook pages or groups. You can make every Facebook page you have relate to one Instagram account (without your app/phone), one Twitter account, one Pinterest Pinboard, one Tumblr blog, one Google My Business location, one Google+ profile or business page, one Linkedin page/profile, one Blogger blog, one Shopify blog, one of your Wordpress website, etc. That's why a Fan Page Robot account can only be connected with your own Facebook account. If you want to manage fan pages owned by another Facebook account, you can either make your Facebook account an admin of the fan pages owned by the other Facebook account, or add a Fan Page Robot subaccount. Does Fan Page Robot support other languages? Does it work if I live in a small country? It doesn't really matter what language you are using and where you are when you're using Fan Page Robot. As long as you can use Facebook in your country, you can use Fan Page Robot. All features work the same for all the languages and countries. Besides, the list of "Google Trending Keywords" provide hourly data for all the countries where our clients are located, such as the U.S., U.K., Japan, Australia, Brazil, Canada, Germany, Italy, Russia, Spain, South Africa, etc. If your country isn't on the list, please contact support and we will add it. I'd like to automate my Facebook and Twitter account to post related news from a specific subject. Can I do that through your service? When you auto post content from a specific website, there is a setting you can use so you only post the content having certain keywords, such as "apple watch". How can I publish or autopost the content from a website to my fan pages or social media accounts? 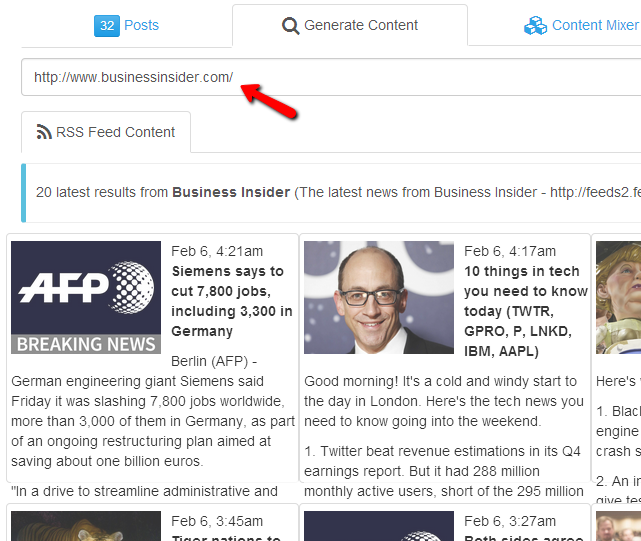 Go to the Generate Content tab, simply enter the URL of the website, and click on the Search/Load Feeds button. That's it! Sounds like magic but it's real. Fan Page Robot will load the content from the website and you can share the posts from there. The URL can be a URL to the homepage of a Wordpress site, a category page of a blog, a website's RSS feed, or a public social media fan page on Facebook, Twitter, Tumblr, Pinterest, Instagram and Youtube Channel! If you want Fan Page Robot to autopost for you when there is new content, click on “Save Feed to Content Mixer” and then go to Content Mixer, enable the Autopost function. How can I use Fan Page Robot to improve my website's SEO? 1. Connect your Facebook fan page with Blogger (or your Shopify blog), and post your links to Blogger. Be sure to use a theme that allows “dofollow” external links, benefiting the SEO of your main site. 2. Connect and post to your Tumblr blog. Tumblr is a social network with “dofollow” links so it can increase your traffic dramatically. Our advice? Use the right hashtags and consistently post good content. 4. Create a blog category on your Blogger, Shopify and Wordpress sites. 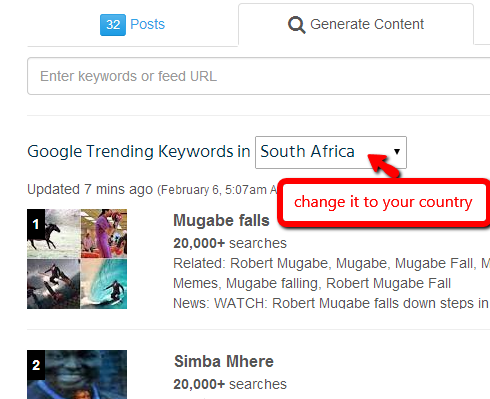 Use our Combine Multiple Social Posts Into A Blog Article feature to automatically fill it with your keywords.